This is a simple, early fall table setting I created for my dining room. It’s not too fancy, but is pretty and charming. I love to use natural elements in my home and decided to use fresh-from-the-orchard apples and dried hydrangeas for this fall apple harvest tablescape. For the table linens, I went to my favorite local fabric shop and found this fabric that resembled a vintage grain sack. Originally, I was going to make burlap placemats, but I fell in love with this fabric. I began searching the rows of fabrics and found a coordinating botanical print for the napkins. It’s super easy to make your own placemats and napkins (tutorial coming soon). I found this vintage, white china at a local thrift shop. Isn’t the embossed pattern amazing! I have had them for months just waiting for the perfect debut! There were only eight dinner and salad plates, but I purchased them knowing that I could easily mix and match this pattern with other white dishes I already have. To keep things simple, I used my everyday silverware tied with a braided jute ribbon at the top of each setting. The silver cups are another thrifted find. They are from a Philadelphia restaurant and date back to the late 1800’s. They’re tarnished, but I kind of like them that way. When I use them for serving, I add a small glass dessert cup that fit perfectly. After I added some shredded paper for filler, I placed a small Gala apple and some dried hydrangea in each cup. Each setting has a bay leaf “place card” and I used a gold Sharpee marker to write the names on each leaf. In the center of the table is a wood serving board that Mark made for me. I’ll share more about the serving board in another post. 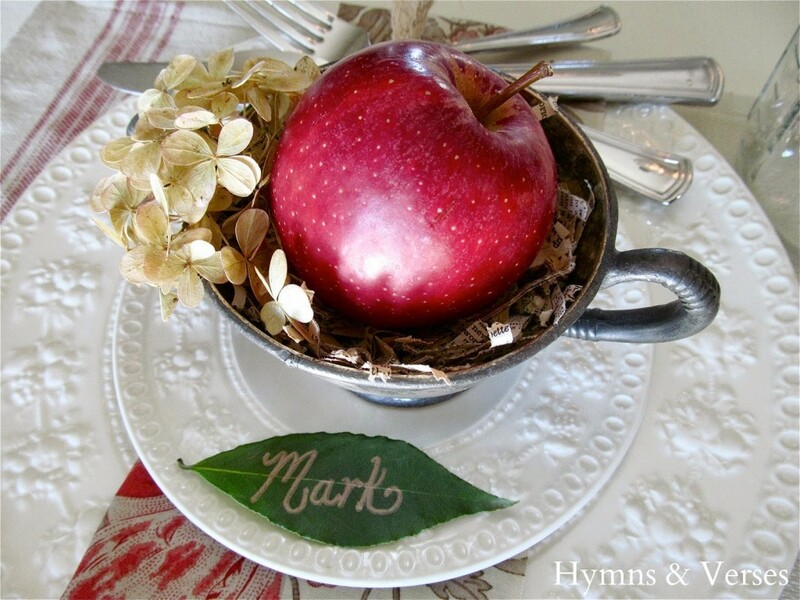 With an apple harvest themed table, you absolutely must serve apple cider! I used my pewter pitcher for the cider and mason jars for drinking glasses at each place setting. 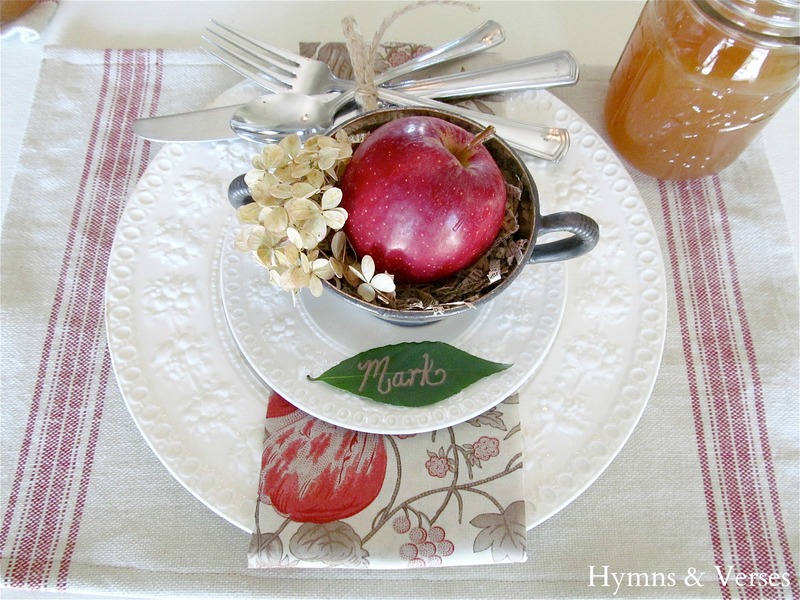 I hope I’ve inspired you to create your own fall apple harvest tablescape! Get creative and put your own spin on this idea! Your table setting is truly inspiring, Doreen! I love your use of natural elements. I love your table setting. The combination of apples, cider and the pewter accents blend together so well. What a lovely introduction to fall decorating! Your table is just beautiful Doreen! It is so inviting! And what a great breadboard! Oh my goodness, that table setting is gorgeous! I'm in love with this setting—oh, I love the french feel of the placemats–and your right, so much cheaper to make yourself. I swoon at white dishes and your pewter pieces—double swoon. Love the breadboard, can't wait to hear more about it! Beautiful and classic! I love the placemats and dishes and everything! I need to definitely set my table like this!! OMG this is just so fresh and country charming! I love your placemat idea, I need to hurry to my fabric store for that one. And your tablescape would fit perfectly at my place right now. This is a wonderful fall table setting. 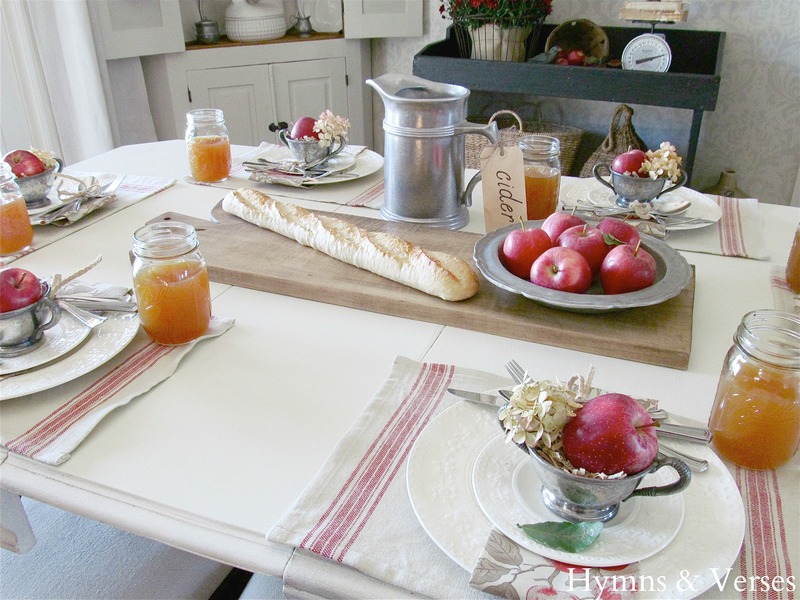 I LOVE this…the placemats and napkins, the apples and hydrangea in the silver cups, the breadboard in the middle, the cider…Beautiful! Such a beautiful tablescape. Love the apples. So pretty. 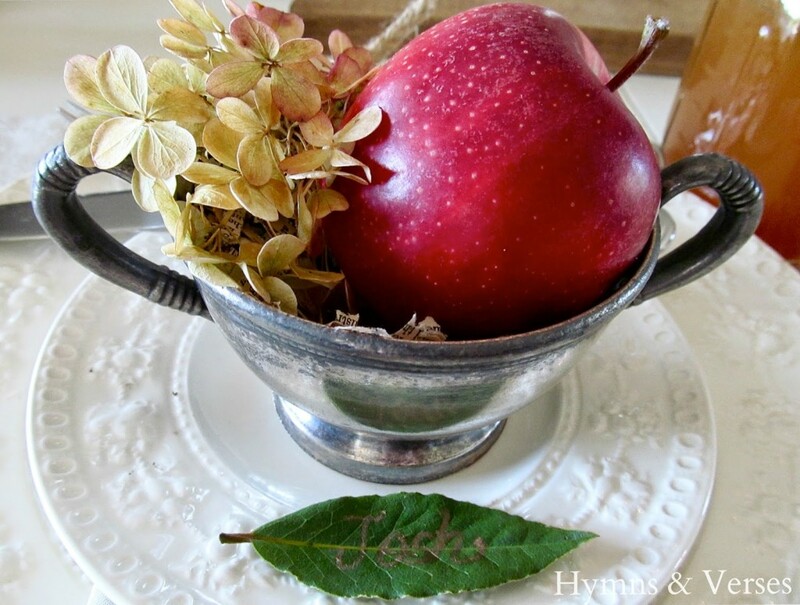 I love the antique pewter pieces with the apples and dried hydrangeas~wonderful elements and textures for fall! Very pretty! You combined wonderful items together. Love the pewter! There are so many things I like about your tablesetting and things I can take away. I need Kevin to make me a breadboard!! I love how you used hydrangea, made your placemats and napkins to coordinate, and your restaurant finds! I'm jealous!! Simple, yet has a statement, too. Love the red apple, your serving board, and the leaf made me smile! Love, LOVE your tablescape! Do you recall where you found the large glass vase? Love it!!! Yes, I found it at HomeGoods! It was under $20 and is really a heavy piece! Keep checking there, Marshall’s, or TJX for something similar! Your table setting is just gorgeous- so perfect for fall! You have such an eye for detail Doreen! 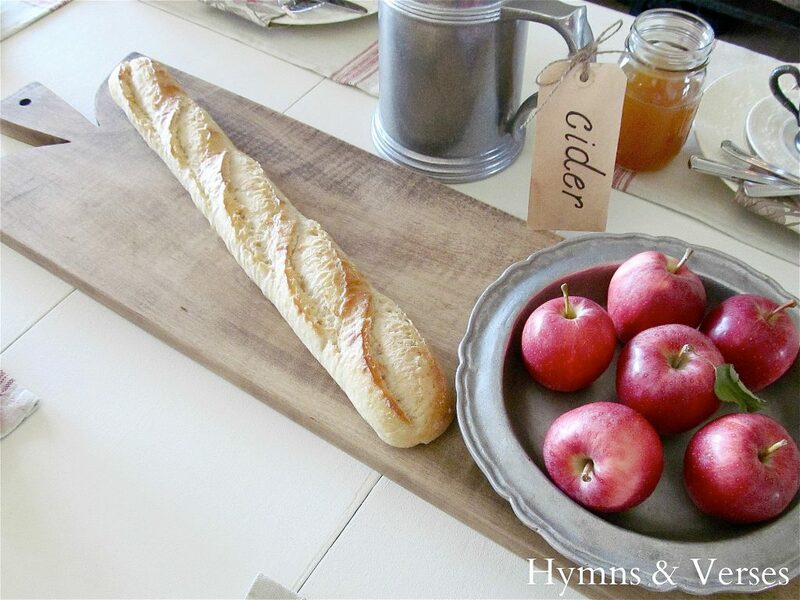 I do hope you share more- that bread board is amazing and those thrift store finds- I love it all!! Thanks for sharing!